Right at the Dresdner Heide, in an idyllic location on the outskirts of Dresden, you find our new comfortable holiday apartment “Elbflorenz”. At 80 square meters living space we offer two separate bedrooms and a high quality kitchen with an elegant design that contains both dishwasher and washing machine. Dresden and its wonderful surroundings have a lot to offer for everyone! Our exclusive apartment “Elbflorenz” has the ideal location for trips to Dresden’s sights, Saxony Switzerland and Elbe Sandstone Mountains. 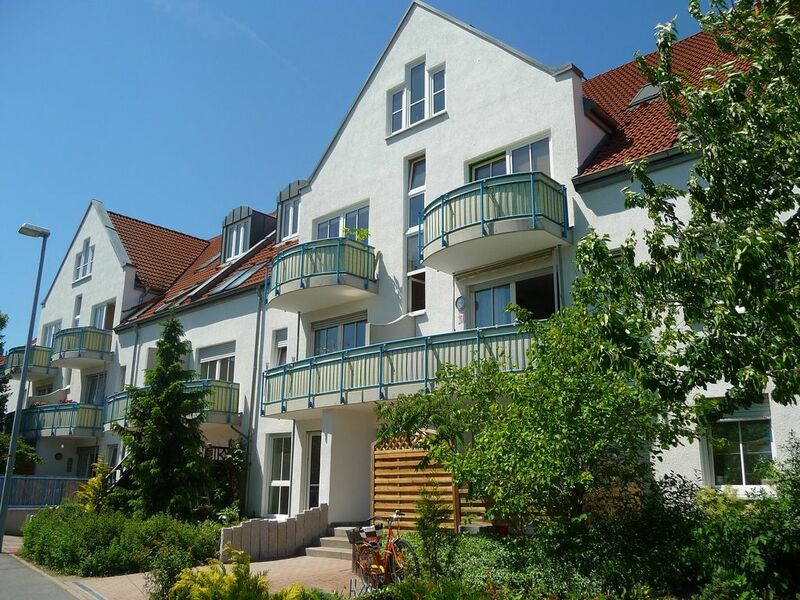 “Holiday apartment Elbflorenz” – this means: Enjoying wonderful holidays all year round in a private and elegant atmosphere. Dresden – Culture metropolis with a green heart: A few steps along the vineyards, a walk through the large garden, a trip to the Dresdner Heide – it is not difficult to get to the countryside from Dresden. The fact that Dresden is popular both with its inhabitants and with visitors is largely due to its fantastic location in the middle of a gorgeous landscape: on the Elbe waterside, with its slopes rising up gently towards the city, and in the immediate neighbourhood of Saxony Switzerland with its forests and rugged sandstone formations loved not only by climbers. Saxony Switzerland – Elbe Sandstone Mountains: Very recommendable are trips in the surroundings to Saxony Switzerland (Königstein fortress, the Bastei cliffs, Rathen spa town), Elbe Sandstone Mountains (Bad Schandau spa town, Hohnstein castle, Stolpen castle, Pirna, Kirnitzschtal tram), Bohemian Switzerland and Moritzburg castle – all accessible in less than 40 minutes by car! Dresden surroundings: Bad Muskau spa town with its unique Fürst-Pückler-Park (UNESCO World Heritage Site) can be reached in a 1.5 hours drive, Prague’s wonderful historic city centre in 2 hours. Also 2 hours away is Berlin! If you wish we can also offer you an ideally located holiday apartment in our capital – about 10 minutes by tram from Alexanderplatz, very quiet, cosy and equipped to a high standard! The Spreewald forest is very beautiful as well and has a lot to offer with its countless boat rides and leisure activities. Also well worth a visit are Görlitz, Bautzen with its Oberlausitzer Heath and Pond Landscape (Germany’s largest pond landscape), Meißen with Albrechtsberg castle, and Chemnitz. All of these sights can be reached in a 1 hour drive! In the bathroom, you can take a relaxing bath at the end of an exciting day. Relax in our extra large bathtub with enough room for 2 people. Let yourself be enchanted by the candle light and the sounds from our built-in radio. Schöne saubere Ferienwohnung mit hochwertiger Ausstattung und Liebe zum Detail. Toll fanden wir auch die Nähe zur Dresdner Heide. Die Wohnung liegt etwas außerhalb von Dresden und man ist sowohl schnell in der Innenstadt als auch am Schloss Pillnitz und in der Sächsischen Schweiz. Der Kontakt zur Vermieterin und auch bei der Schlüsselübergabe war sehr freundlich. Wir kommen auf jeden Fall im Sommer nochmal wieder! Guten Start für Sie ins Neue Jahr ! Es gab kein heißes Wasser zum Duschen am Morgen. Dann war die Wohnung verstaubt. Die Besteckschublade war schmutzig. Die Matratzen sind durchgelegen und in die Mikrowelle passt nicht mal ein Teller. Dann war es sehr laut im Haus. Jedes Wort / Satz ist überflüssig !!!!!!!!!!!! Diese Ferienwohnung hat die 5 Sterne mehr als verdient. Die Unterkunft hat uns gut gefallen. Alles war sehr sauber. Die Betten sind bequem und in der Küche ist alles vorhanden, was man zum Kochen benötigt. Wir hatten schöne Tage in Dresden und Umgebung. Vielen Dank! Wir sind von der Wohnung restlos begeistert. Vielen Dank für diese schöne Wohnung. Gute Ausstattung mit viel Liebe zum Detail. Wir haben die Tage hier sehr genossen! Wohnung wie beschrieben.Super! Sehr hochwertig! Super Ausstattung! Super Lage! Sehr netter Kontakt.Wohnung wie im Inserat beschrieben.Sehr zu empfehlen. There are endless possibilities for excursions within the near and far surroundings of our holiday apartment! You will find shopping facilities for everyday goods and excellent restaurants in the immediate neighbourhood. Day trips to Saxony Switzerland, Elbe Sandstone Mountains, Upper Lusatia, Görlitz, Bautzen, Prague, Ore Mountains, Spreewald forest, and much more are easily possible by bus, train, boat or car. Trouble-free and without having to transfer, you can reach Dresden downtown by using the park and ride parking Bühlau (Ullersdorfer Platz), 5 minutes away by car from the apartment. This parking has transfer to buses and trams. Alternatively, you can take bus 61 directly from Dresden Weißig. The cycling track Dresdner Heide-Saxony Switzerland is in the immediate neighbourhood of our apartment. In the summer months, you can relax only 2 km away in the swimming pool “Marienbad” – with boating pond, nicely built playground, boat hire. Golf Complex Ullersdorf is only 1 km away from our holiday apartment – in marvellous surroundings. This beautiful 18-hole-golf complex with golf school, driving range and excellent Italian club restaurant will wow you. Golf Club Dresden is only about 30 minutes away. It is situated in the southern outskirts of Dresden on the former estate of freedom fighter Ferdinand von Schill. It is characterised by sophisticated ways of playing and all challenges of modern golf sport in a wonderful landscape.